All water sources should include flowmeters that are technologically current, accurate, reliable, well maintained and—ideally—continuously monitored by a Supervisory Control and Data Acquisition (SCADA) System or similar monitoring system. The water supplied value is calculated as a composite value that includes as components the primary untreated and/or treated water meters, meters registering water going into and out of tanks, basins and reservoirs, and meters measuring water across pressure zones or district metered areas. Water supplied at the entry point of water distribution systems; either at treatment plant, treated water reservoir, or well effluent locations. Zonal metering into portions of the distribution system being supplied different pressure. Also includes metering at major distribution facilities such as booster pumping stations, tanks, and reservoirs. fictitious County Water Company. 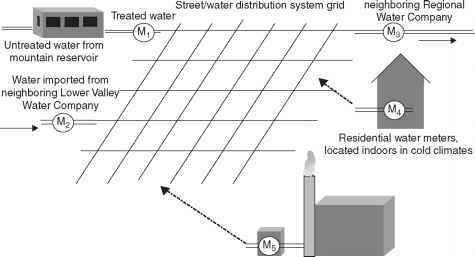 As shown, source meters should exist at the point where the treated drinking water leaves the water treatment plant, shown as metering location (Mj). At this point the water quality has improved from untreated to potable quality and the water has been pressurized for conveyance in the distribution system; hence the monetary value of the water is greatest at this location. 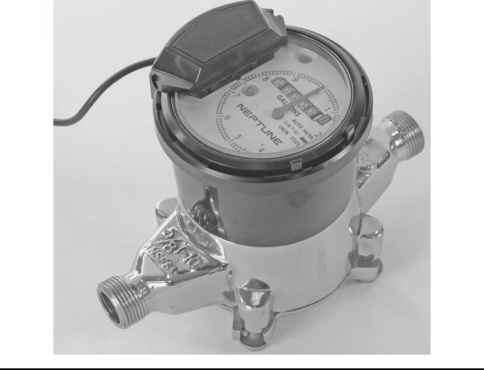 Source meters should also be included at any points of imported (M2) or exported water supply (M3). Finally, water meters should be included to measure flow entering or leaving tanks or reservoirs, and crossing pressure zones and DMAs. Volumes of water purchased and imported from a neighboring supplier should be added to the composite metered values to obtain the water supplied value. The source meter (M2) in Fig. 6.1 registers water purchased from a neighboring water utility by County Water Company. Interconnections between water utilities should always be metered. Such meters should be carefully maintained and monitored since the metered data provides the basis for billing large water volumes. Both the water utility supplying the water and the system purchasing the water have a strong motivation to keep this bulk measurement accurate since significant costs are at stake for each water utility. Any water volumes sold and exported outside of the distribution system to a neighboring water utility should be monitored and adjusted with the same scrutiny given to imported water, for the same revenue implications exist. The source meter (M3) in Fig. 6.1 registers water sold and exported out of the County Water Company grid. Flows at storage facilities should be balanced for the water audit period. If source meters are located upstream of reservoirs and storage tanks, then stored water must be accounted for in the water audit. Generally, water flowing out of storage is replaced; as the "replacement" water flows from the source into storage, it is measured as supply into the system. If the reservoirs have more water at the end of the audit period than at the beginning, then the increased storage is measured by the source meters but not delivered to consumers. Such increases in storage should be subtracted from the metered supply. Conversely, if there is a net reduction in storage, then the decreased amount of stored water should be added to the metered supply. Table 6.2 shows how to figure the change in storage volume using data for County Water Company. Remember, decreases in storage are added to the supply; storage increases are subtracted from the supply. In this case, the net reservoir and tank storage was a drop in storage volume so the adjustment of 0.83 million gal should be added to the value of water supplied. Table 6.3 shows data for County Water Company and a series of tabulations that the water auditor should follow to arrive at the proper value of water supplied for a retail water distribution system. The procedure to obtain the data included in Table 6.3 is discussed below. Identify all water sources that are owned or managed by the water utility to supply water into the distribution system. Such sources can include raw water that is treated adjacent to sources such as wells, rivers, streams, lakes, reservoirs, or aqueduct turnouts. However, most water audits are performed on the potable water distribution system so that the "source" is often the location where treated water enters the distribution system; which is often the effluent of the water treatment plant. All volumes from such sources should be metered, with routine meter testing and upkeep conducted so that volumes of water taken from the sources are registered accurately. Data should be available on a daily, weekly, or monthly basis to compile into an annual volume of water supplied from each source. Meter information can be kept in a table similar to Table 6.4.
does not hold true in reality, as a portion of the water passing through a treatment process is lost due to plant infrastructure leakage and process uses such as backwashing of filters, chemical mixing, and maintenance activities such as flushing. Metering water at the source of withdrawal is essential and many regulatory agencies require this in order to track water resource utilization. However, it is recommended to also meter treated water at the location when it leaves the water treatment plant; particularly if the water treatment plant is distant from the water source. • Any other adjustments such as losses that occur before water reaches the distribution system. 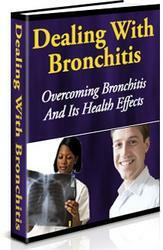 One example would be losses incurred during the treatment process (filter backwashing, etc.) if the source meter is located upstream from the water treatment plant. None are included in the example data shown in Table 6.3 so a volume of zero is entered on line four of this table. f A percentage, written as a decimal (95 percent = 0.95) taken from meter testing performed regularly. t The corrected meter volume for sources 1 and 2 is 2,737.84 + 879.81 = 3617.65 million gal; note that this is 136.89 million gal greater than the raw total supply given for these sources in Table 6.5. Table 6.6 Volume of Water from Own Sources in Million Gallons for County Water Company—Adjusted for Source Meter Error and creating spreadsheets or databases that properly balance flows such that an accurate value of water supplied is attained and made available to the water audit each year.